Primary small cell neuroendocrine carcinoma (SNEC) of the nasal cavity and sinuses is an extremely rare tumor and is difficult to diagnose. Although these tumors exhibit morphological features similar to those of anaplastic small cell carcinomas of the lung and, at first, were thought to arise from the lung, they are now considered to be completely different entities due to their behavioral differences in relation to metastasis and local spread. Also SNEC shows similar clinical and morphological features to olfactory neuroblastoma (ONB) and must also be distinguished from this tumor. The diagnosis of SNEC of the head and neck region is based on the recognition of the typical neuroendocrine architecture and morphology and on the immunohistochemical confirmation of neuroendocrine differentiation. Initial symptoms include nasal congestion, epistaxis, headache, persistent sinusitis, and a neck mass. The mean age for most patients with this diagnosis is 49.2. The class of endocrine tumors, SNECs are subdivided into well-differentiated tumors, well-differentiated carcinomas, and poorly differentiated carcinomas depending on their histopathological and biological characteristics. No specific treatment exists, at present, a multimodality approach, using surgical resection, systemic chemotherapy and radiation, is used in the treatment of most patients. Recurrence is frequent and the prognosis is poor. The follow-up interval for surviving patients ranges from 13 to 172 months (median 60 months). Median overall disease free survival (DFS) is 23.6 months while overall survival (OS) is 58.6 months. 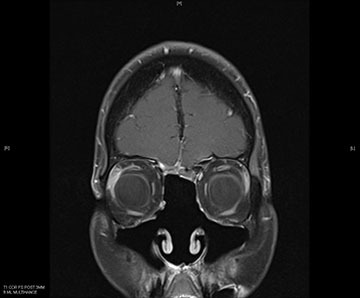 This is a 61-year-old female who initially presented 3 years ago with right-side nasal obstruction. 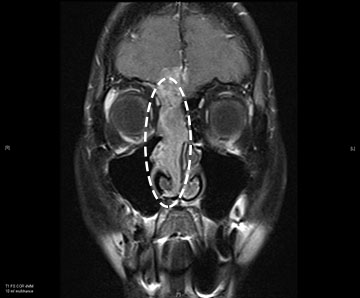 An outside CT scan indicated a nasal mass. On endoscopic examination of the nose and sinuses and additional CT and MRI imaging done at our institution confirmed the existence of a right-sided nasal mass. The mass extended into not only her sinuses but also her brain. Pet/CT scan demonstrated no evidence of any further spread of disease. In the operating room a biopsy was taken and the pathology returned positive for a SNEC. She then underwent an endoscopic resection of the tumor through the nose and sinuses in a joint surgery that required an otolaryngology surgeon and a neurosurgeon. The entire tumor, including the portion in the brain where taken out through the nose and the cerebrospinal fluid leak was repaired during surgery. Post surgery, she began chemotherapy and radiation therapy. She is now 2 years out from surgery and followed every 6 months with new MRI and PET scans. Her most recent MRI remains unchanged and there have been no signs of recurrence.